I have Norton Security Suite from Xfinity installed in my computer running Windows 7 Ultimate. 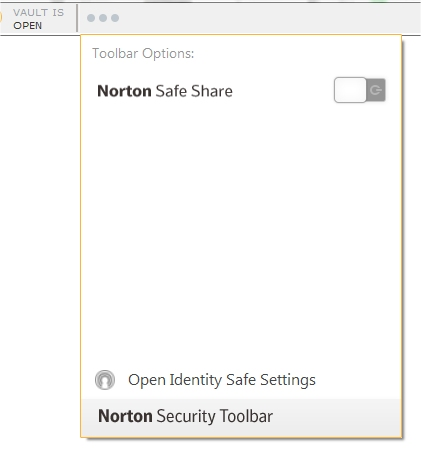 This morning I see that Safe Search disappeared from IE11 after a Norton patch update today September 16 and there is no choice to enable or disable it in the '...' settings. I have also looked in the Manage add-ons in Internet Explorer and all Norton options are enabled there. Re: Norton Sefe Search is gone from IE11 after patch Norton patch. try run LiveUpdate till no updates found + Restart (not Shut down) machine. Repeat. Ran LiveUpdate till no more updates available and restarted Windows, but that did not fix the problem. Will wait to see if anyone else is having the same problem. Yes, I did try it and it worked at first, but after a restart of the browser, it again disappeared. I then restarted Windows and the browser and it still is not there, nor is this option reflected in Norton settings. From the main dashboard of NSS, select Help and then Support and let it run and see if it finds/corrects anything related to the installation. If it finds nothing I would suggest going to the following Comcast link and updating your NSS to Norton Security Online - which is the latest free offering from Comcast. If you need additional help with the update to NSO please post back. BTW - I still Safe Search available on my WIN 7 NSO installation that you are missing in your image. I did a fresh install, after this, the Norton Safe Search was working fine. Norton downloaded the patch again and again the Safe Search option is nowhere to be found. I have a feeling that I will have to live without this option for the time being. Thanks for your suggestion, though. I will keep an eye out for some other suggestions that might come along. Thanks, I did what you suggested by letting it scan for problems, but was unable to find anything wrong. I will keep digging around and looking for others things to try, I can use the Safe Search web page while a solution is found. Just an off the wall suggestion - have you tried it using another browser? Here is another download for Comcast's version of Norton Security Online, you may want to try to install NSO using that download, although I'm thinking it will also need to be updated.